One of the enduring food memories from my childhood is of my father taking us to the markets each Sunday to buy fresh food for the week. He often purchased cases of navel oranges, apples, nashi pears and my favourite, persimmons, with the reasoning that buying in bulk meant you were theoretically saving money even when you didn’t actually need that 5kg of oranges. Dad loved a bargain then especially when it came to food. Being my father’s daughter unfortunately did not teach me to be particularly money-wise when I was a student. I had a penchant for 2 for $30 dresses that were poorly made and didn’t last beyond several washes (but so cheap!) and more than once I bought expensive lamb cutlets instead of rather essential toilet paper. Needless to say, we now always have mind-bogglingly large packs of toilet paper squirreled away at home. B can’t understand my obsession with having “enough” toilet paper. When you are the daughter of a bargain hunter however, you may sometimes find yourself in possession of a quantity of some food item greater than what you could possibly consume or want. In this case, the thrill of buying cheap strawberries got the better of me last week. After the novelty of eating them by the handful wore off, it came time to make quick use of the remaining punnets. 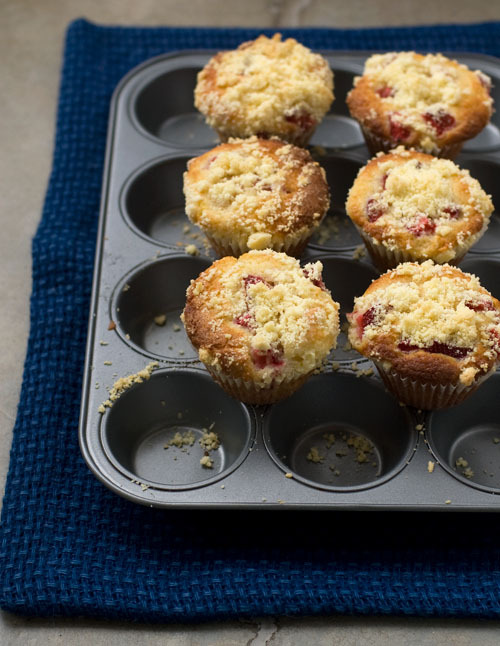 A dozen strawberry muffins, flavoured with a hint of vanilla and orange peel and topped with buttery crumble, were served up for second breakfast one morning. 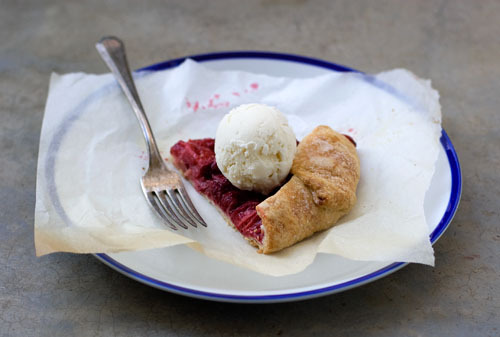 The following evening, we had this strawberry galette for dessert. Fruit galettes are one of the simplest and most delicious things you could ever bake with fruit. Berries in particular. Soft oozing berries and crisp butter pastry form one of those happy friendships that will hopefully always transcend food trends and the test of time. Forget lamb chops and toilet paper. We all need more strawberries and sweetness in our lives, and despite not being much of a sweet tooth, I have a sneaky feeling dad would approve. Hull the strawberries and cut into thirds widthways (or quarters, if they are particularly large). 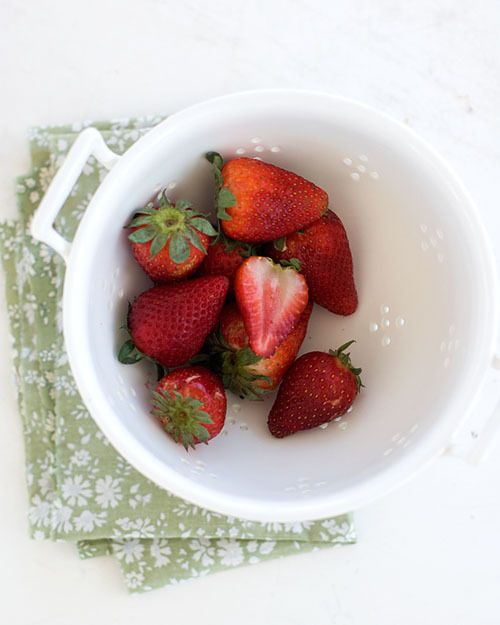 Toss the strawberries in sugar, vanilla extract and cornflour and set aside. Roll the pastry out to a rough circle about 5mm thick. The pastry does not need to be a perfect circle as the edges will be folded in. Rustic is good, in this case. 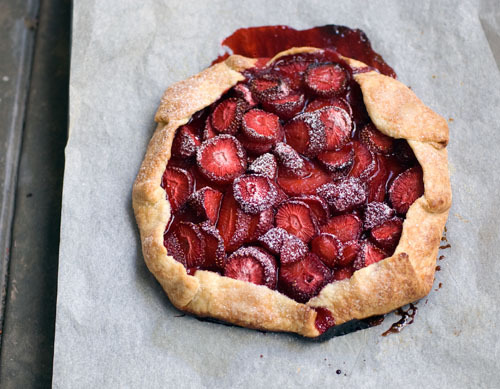 Pile the sliced strawberries into the middle of the pastry circle, leaving a 3cm border all around. Fold the border over to partially cover the fruit. Sprinkle the folded edges with the extra sugar. Bake for 35-40 minutes or until the pastry is crisp and golden brown. Allow to cool a little before dusting the top with icing sugar, slicing and serving. Place the butter, flour, salt and sugar in a food processor. Blitz until it resembles breadcrumbs. Add the water and pulse until dough almost comes together. Tip the dough out, flatten with the palm of your hand to form a rough disc. Wrap in plastic and chill for at least 30 minutes before using. I must be getting old. Ahem. Older, I mean. Even if you discount the more rigorous application of face cream, the ownership of bed socks and my inability to use the word ‘sick’ when not referring to the fact I feel physically unwell, other signs well and truly exist. Perhaps it’s just that I’m noticing the little things more. Like how pleasing it is to experience the crinkle of dried leaves underfoot. Or how beautiful it is after the rain (that we’ve experienced plenty of this Winter), when umbrellas are downed and fallen leaves resemble pasted shadows on slick pavements. There was a time when I recall constantly being in a rush to be somewhere different to where I already was. Wanting to be taller, yearning to be older; needing to acquire, consume, and never feeling satisfied. These days I don’t mind that age is holding my hand gently. Age stays the hand of the girl who once threw a head of broccoli against the kitchen wall in anger. A spray of green flew right back at her, as though Spring had sprung in the room. Now age and I cross the road arm in arm, pointing out those little things that are capturing my attention all over again. Like the pleasure of those extra salty, extra crunchy bits at the bottom of a chip packet, or one bite of cake and one sip of tea, repeated until either or both runs out. Sometimes I want to let go and run until my legs are screaming and I’m back there again – needing, wanting, acquiring, consuming. But age won’t allow it. So yeah, I must be getting old, and you know what – it doesn’t seem like such a bad thing. Position a rack in the lower third of the oven and preheat to 205’C. Line the muffin tin with pleated paper liners. In a medium bowl, mix the flours, baking powder and salt. In another bowl, whisk the eggs and sugar together. Whisk in the milk, butter and dried lavender. Pour the wet mixture over the flour mixture and fold gently until all of the dry ingredients are moistened but the batter is still very lump and uneven. Add the frozen berries and chocolate and fold until just distributed throughout the batter. 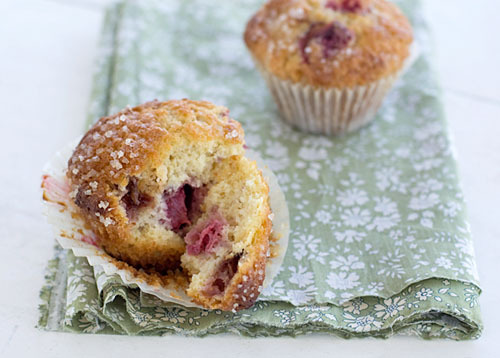 Do not try to create a smooth, homogenous-looking batter, or your muffins will be tough. 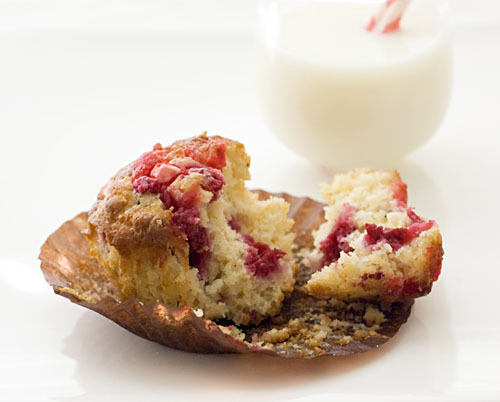 Divide the batter among muffin cups. 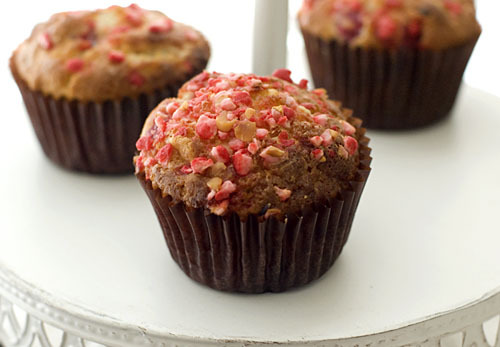 Sprinkle some pink pralines over each muffin. Bake for 15-18 minutes. Toothpick inserted into batter should come out clean.